Does your MS Access application frequently showing error text notification regarding damage of your Access Macros And Modules? If yes then don’t rush here and there for the solution. As, this tutorial is written with the main prospective of providing solution to repair damaged access modules and macros objects. So, enjoy reading this post till the end to know the best solution to fix this issue. Today high level corporate industries and organization deal with huge amount of data on every day basis. They have to keep thousands of employee daily reports and records of several transaction work and many more things. all such data have to be managed in such a manner that users can fetch nay form of data or details from that huge cluster easily. In this ms access provides a data management system which gives users with a flexibility to update, remove or edit any information whenever needed. It also allows users to create forms, Tables, reports, queries, macros and VBA modules which cover front end (load/entry) and back end (reporting/maintenance). However as we all know error can occur even in the most secure of user defenses and MS Access is not exception to this. The most vulnerable point of MS access; where most of the error occurs is Macros. While macros introduces a level of automation within access, scripts that makes execution of macros possible can get corrupt easily and leads to some unexpected errors. One of the most commonly occurring Access Macro errors is “Action failed error: 2950”. Likewise you must get issue with Access modules. Before approaching for the fixes to solve damaged access macros and modules issue, first discuss what’s the role of this macros and modules in Access . Let us discover the causes behind this error and a few easy solutions to fix it. Access macro tool allows you to automate tasks and add functionality to your reports, forms and controls. Suppose, if you need to add a command button in form, you associate the button’s OnClick event to a macro and the macro contain the commands regarding the tasks that you want to perform each time when it is been clicked. Macros enable you to add functionality to forms, reports and controls without writing code in a visual basic for application (VBA) module. Macros offers a subset of the commands that are available in VBA and users find it easier to build a macro than to write VBA code. Modules are the places where you store VBA code. but you can‘t record a macro in MS access, so modules are the place where you will get all the VBA code you have written by yourself and also the code written by various wizards of Access. A module is a collection of declaration, statements and procedures that stored together as a unit. Modules are very much similar to macros as they are objects that add functionality to the database. However when you create macros in access by selecting from a list of macro actions, VBA programming language is used to write modules. Reasons of access macros and modules damages are so many but here we listed done some most common and reasonable one. Data synchronization is the best way to sync your huge data between two or more devices but if it won’t done correctly and then it can make your data inaccessible. Virus attack is most common reason for corruption for access database and as a result of which its object got damaged. Virus easily corrupts your files or databases by deleting some its parts or by overwriting the file. Sometime hardware failure during data saving or transferring is also the reason behind such Access objects damage. At this time, there are great chances of your database getting corrupt. Sudden or abrupt system shutdowns also be the reason to damage of your access macros and modules or even lost your data forever. Below here are some best fixes to resolve this damaged issue. you can apply any of the following. This will open MS Office Security Options dialog box. Here click on enable this content option. At last Clickto the OK option. These steps should be repeated each time you open the database. Note the path of the trusted location listed. Now Add new trusted location. For this, make a tap to the add new location and then specify the path of the location that you want to add. Once you get the trusted location list, move the access database to any one of them. If you suspect that the damage is in your macro or module; you could make a new macro or module and then copy the undamaged contents of the original macros or module into it. Sometime the reason of the damage is also the non-ASCII characters that are creeping into the module. So try to save the file as the text file and remove all the illegal entries, if it contains. Save the file and reload it. If in case the above solution fails then also you need not to worry as in such cases you need to reach out to Access Repair And Recovery tool for advanced troubleshooting and solutions of MS Access Database issue. 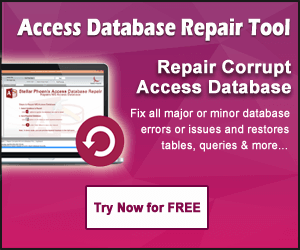 There are various advantages of using the tool such as it repair corrupted/damaged .accdb and .mdb files, restore each and every data and such as reports, tables, queries, macros, forms, etc.. If you want to restore all your valuable data back from corrupted access file then you need to use Ms Access File Repair Tool, as this is very helpful tool to fix any kind of error occurred and can fix any type of corrupted access database. 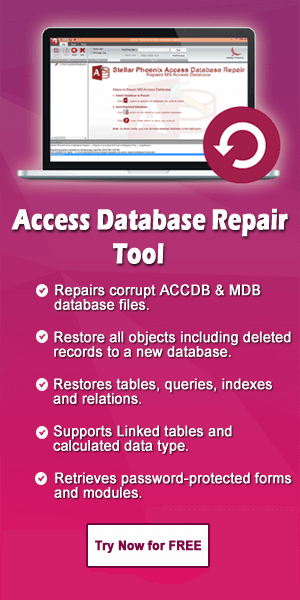 The software allows you to recover permanently deleted data from MDB file. Though access allows you to repair damaged access databases using the Compact And Repair in built utility tool but in case of damaged access macros and modules repair, this tool also won’t work. However there are certain limitations to this utility. The utility can only repair only the tables, indexes and queries in the damaged database and doesn’t attempt to fix damaged macros or modules. Another disadvantage is that if the database is severely getting damaged then this inbuilt tool also won’t work to make successful restoration of database. So you are advised to make a regular backup of your database, especially if you are making constant use of them. ← [Infographic] Access Vs Excel: Which One Is The Best?